In all of our ERP projects since 1996 no client has ever said “My last ERP implementation was a good time. Everything went just as planned.” The recollections and stories are usually quite the opposite. The reasons ERP implementations are almost always over budget, take longer, and cost more than planned is explained in our 1-hour implementation control webinar. In response to these persistent problems, EAI has built and tuned over the years an implementation approach that controls project factors that cause these typical problems. The main difference in the EAI implementation approach and the ‘typical implementation approach’ is the level of project ownership and control by the buyer of ERP. This includes the imperative for the buying company to fully own the future-state process planning, design of metrics, data migration, and identification and retirement of existing process support tools (forms [paper or electronic], spreadsheets, databases, point applications, etc.). The project participants described below are required to support the ERP implementation. A fundamental point about the team hierarchy shown below is where the ERP project management is conducted. With the ERP buyer’s Internal Project Team having the experience, skill, and capacity to lead the project, the implementer’s team falls under the project management protocols of the buyer and largely fills the role of the ERP expert and works with the internal team to determine the optimal way to achieve business process objectives with the new ERP. The external implementation consulting firm is effectively comprised of various experts in the new ERP and management. They are not experts in the specific company that will be using the new ERP and the correct business processes/metrics necessary for the company. Therefore their input is always subordinate to those that own and control the business process objectives—but this does not mean the knowledge and advice of a skilled implementer is not valuable. This is critical—especially when the company is attempting to be highly adaptive to the better practice structure of the new ERP. Implementation Process Manager: The ERP implementation control approach detailed in this document seeks to reach exceptional results, described as the ‘True project potential’ with modern ERP software well suited for the Buyer’s business. Toward reaching these results, the following skills, experience, and capacity are necessary from the Implementation Process Manager. Experience with enterprise business software. Knowledge of business processes that will be affected by the new business software and knowledge of best practices in various ERP project-related processes. Familiarity with organizational process design, improvement methods, performance management and business intelligence reporting with the ability to coach and teach other team members. 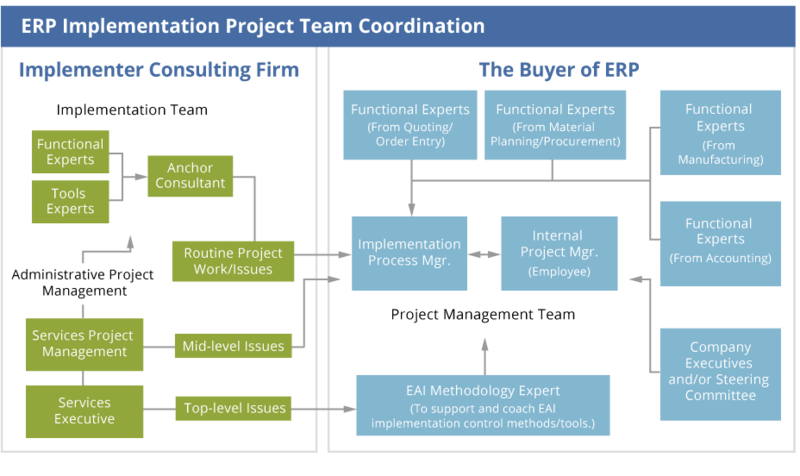 Experience with EAI implementation control methods and project management tools. Usually this must be trained. Being a skilled communicator. Effective style to productively work with all levels of people at the organization who will be using the new ERP. Capacity of 20 to 40 hours per week to support a typical ERP implementation project. Some weeks may require less, depending on the project pace. Proximity to the company’s ERP implementation project reducing travel costs, or moving costs in the case of a full-time hire. Read about the critical things to know, and do, to greatly lower ERP implementation risks and achieve top-level results.